Today we saw the return of the Solar Physics seminars at The University of Sheffield. The seminar entitled "Magnetic reconnection and tearing in a 3D current sheet about a solar coronal null" was given by David Pontin from The University of Dundee. 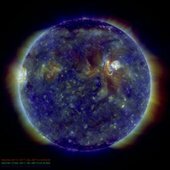 We heard about a study of magnetic structure in the solar atmosphere and attempts to explain energetic events such as flares and other explosive events. These events resulting in reorganisation and restructuring of the magnetic fields result from reconnection phenomena. To understand reconnection we have to look at the exciting territory of resistive plasma dynamics. We are reminded of the contrasting situations of ideal fluid dynamics with infinite Reynolds number and the case of the viscous fluids with finite Reynolds numbers. In dissipative dynamics we therefore have boundary layers (e.g. boundaries between regions of differing viscosity). Such dissipation effects arise when we introduce resistive boundaries in MHD. The resistive boundary layers give new types of plasma instability caused by a loss of conservation of magnetic flux and the reconnection of magnetic field lines. The animation above illustrates such reconnection occuring at so called x-points where flux conservation is broken and the reconnection occurs. 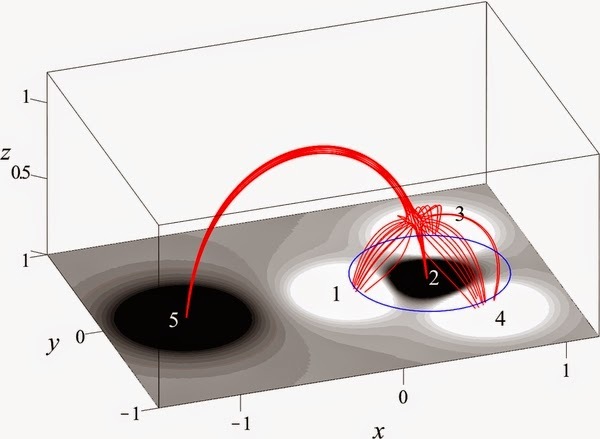 Magnetic null points are regions where the magnetic field goes to zero, such points arise during explosive reconnection events in the active solar atmosphere. Three-dimensional magnetic null points are ubiquitous in the solar corona and in any generic mixed-polarity magnetic field. 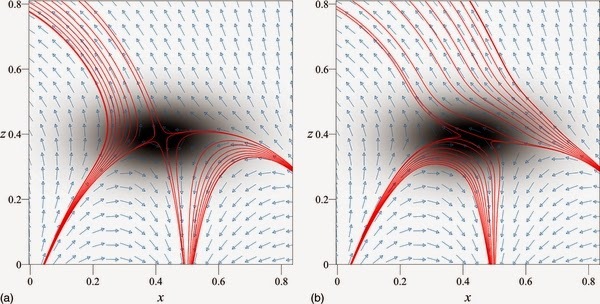 We discuss the nature of flux transfer during reconnection an isolated coronal null point, that occurs across the fan plane when a current sheet forms about the null. We then go on to discuss the breakup of the current sheet via a non-linear tearing-type instability and show that the instability threshold corresponds to a Lundquist number comparable to the 2D case. We also discuss the resulting topology of the magnetic field, which involves a layer in which open and closed magnetic fields are effectively mixed, with implications for particle transport. 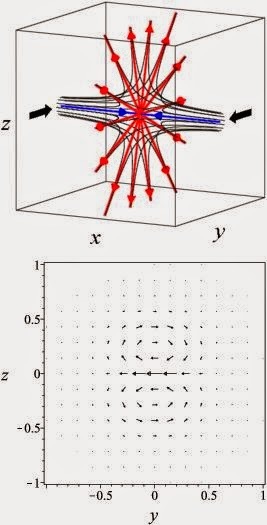 We heard about the spine-fan field structure which may enclose null points and can lead to reconnection events, such a structure is shown above. Magnetic field lines outlining the spine and fan structures associated with a magnetic null, located in a separatrix dome above a parasitic polarity. The shading on the lower surface represents the normal component of B and the dashed line marks the polarity inversion line. 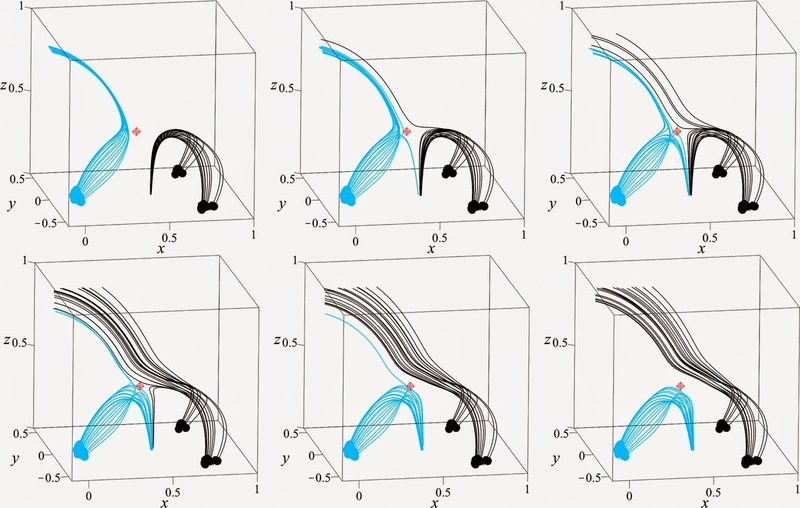 Using resistive MHD to model such a null point located in the centre of a simulation box a stream function applied at the boundaries is used to cause advection of the spines in opposite direction, this is described by the advection coefficient, Ad. The figure above illustrates the initial magnetic field configuration. The spine (in blue) lies along the x-axis and the fan (in red) lies in the x = 0 plane. Coloured arrows indicated the field direction. The black arrows show the direction of shear applied by the driver at the boundaries. Bottom: the driving profile applied to the x-boundaries with Ad = 80. The change in connectivity with two simultaneous pulses (top) one pulse (bottom) and when v0 = 0.04, Ad = 80 and η = 5 × 10-4. The red and blue flux tubes (traced from the driving boundaries) are initially connected to the gold field lines anchored on the side boundaries. Taken at times t = 1 (left), 3 (middle) and 5 (right). These results were obtained using the 3D resistive Copenhagen code of Nordlund and Galsgaard (1997). The figures above show representative field lines traced from fixed footpoints (marked by spheres) located close to the spine axes, at times t = 0, 0.33, 0.38, 0.5, 0.62, 0.8. The footpoints are located in the negative sources, so the motions of the field lines exhibit the flux velocity wout. The location of the null is marked by the red diamond. Frames showing the magnetic field components (arrows) and current density (shading) in the y = 0 plane over x ∈ [ − 0.8, 0.8], z ∈ [0, 0.8] for the MHD simulation. From top to bottom, times t = 1.0, 2.4, 4.6, and 6.0. (a) Representative magnetic field lines at t = 0 in a subsection of the domain for the MHD simulation. The shading on the z = 0 plane represents the vertical magnetic field strength on that plane. (b) Pattern of the driving flow close to the parasitic polarity. Also shown are the normal component (Bz) of the magnetic field at the photosphere, z = 0, at (c) t = 0 and (d) t = 3.0. 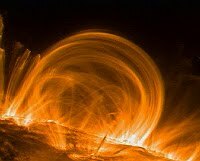 Asymmetric Reconnection at 3D Magnetic Null Points from UK Solar Physics on Vimeo. Above, the shaded contours show |J| (scaled to the maximum of each snapshot), while the arrows depict the plasma flow. For the case of v0 = 0.01 with only one pulse. Above, the shaded contours show |J| (scaled to the maximum of each snapshot), while the arrows depict the plasma flow. For the case of v0 = 0.01 and tlag = 1.8. 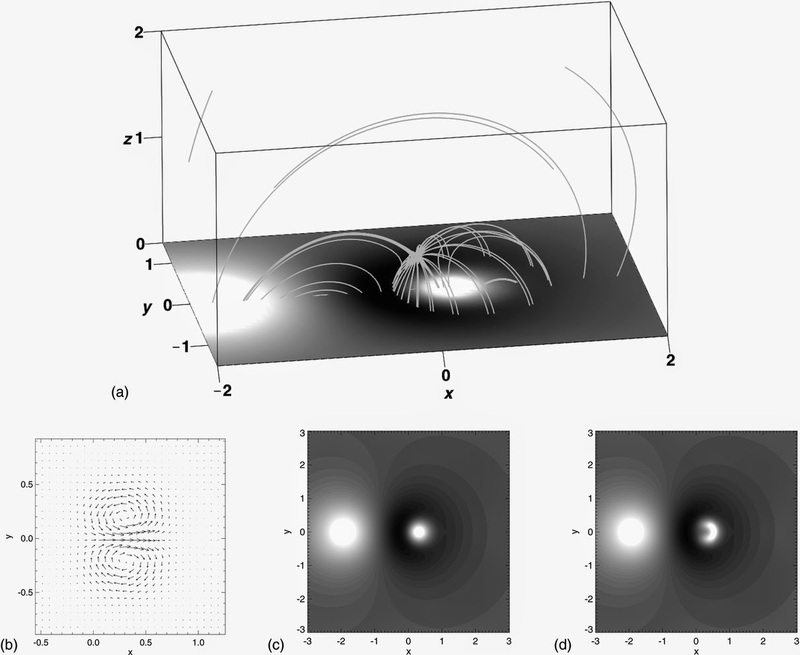 Sample magnetic field lines in the y = 0 plane showing the null point structure at (a) t = 0 and (b) t = 0.8. The vectors show magnetic field orientation and the background shading is proportional to Ey. The field lines in (a) and (b) are traced from the same fixed footpoint locations in the positive polarities near the fan. Field lines of the simple model magnetic field (described in Section 3) outlining the spine and fan of the magnetic null at t = 0. The shading on the lower surface represents the normal component of the magnetic field there. The circle on the lower surface shows the approximate location of the footprint of the separatrix dome (i.e., fan separatrix surface). The numbers refer to source numbering discussed in the text. 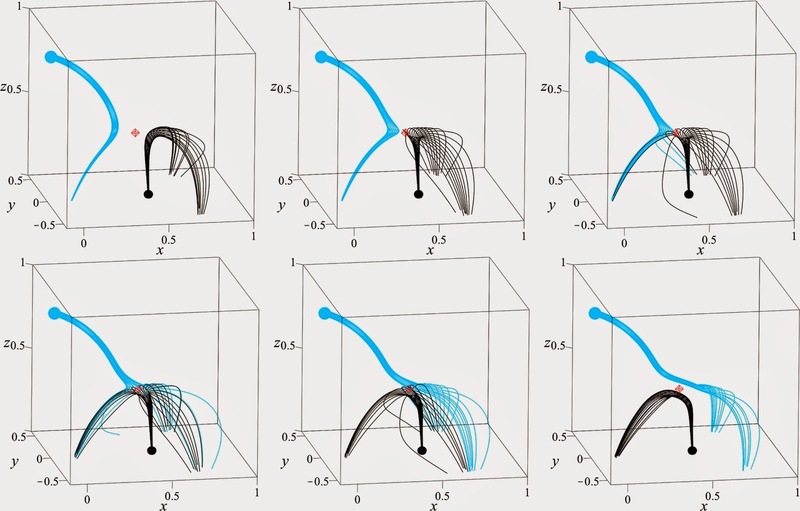 It was interesting to see some of the movies illustrating the propagation of plasmoids through the current street.We heard about the dynamics of flux ropes and how these reconnection events introduce torsional wave motions. Much of this seminar was summarised in the excellent UK Solar Physics nugget entitled "Asymmetric Reconnection at 3D Magnetic Null Points".